Prior to the invention of PET/CT systems, PET-only scanners had an equivalent of extremely crude built-in CT scanners that used PET detectors such as crude CT detectors. These CT-equivalent systems were extremely slow and the images produced by them were non-diagnostic. Moreover, they exposed patients to additional radiation. PET/CT systems introduced correction images exposure. PET/CT systems are also faster, owing to which they help reduce motion artifacts. This unique mix of functional information being gathered with the help of Positron Emission Tomography (PET), with anatomic information collected with the help of Computed Tomography (CT), has led to an increase in the adoption of PET/CT systems from the time they were introduced into clinical practice. PET/CT systems have several major advantages for various applications over PET systems. For instance, PET/CT increases sensitivity for the further detection of small brain metastases when performed with contrast agents and in a full-dose manner. They have helped reduced the time required for patients to lie motionlessly from approximately 40 minutes to 20 minutes. PET x-rays originate from the different radioisotopes present inside the patient’s body, some of which are absorbed (attenuated), which further leads to the distortion of the PET image. The correction of these distortions is mandatory, and PET/CT systems help make these corrections. The management of cancer has evolved to include different modalities of treatment methods, such as chemotherapy, surgery, and radiation therapy. Efficient management requires the accurate evaluation and diagnosis of tumour growth, and PET/CT systems are being extensively used for providing sophisticated images for further assessing the origin of the tumour and the metastatic disease. PET/CT systems are being increasingly adopted for cancer monitoring around the globe. In a study conducted at a major hospital in the Asian region, which consisted of 98 patients affected with various forms of cancer, it was found that PET-CT systems were successful in diagnosing the presence of cancer in 77% of the cases. In comparison, a whole-body Magnetic Resonance Imaging (MRI) was able to do so in only 55% of them. Furthermore, the demand for PET/CT systems is being triggered by the growing demand from radiology departments. PET/CT systems can be easily used to perform standalone CT scans. This has further justified the usage of CT as a part of PET/CT systems for justifying the high investments in this technology. Lifestyle-related diseases, such as obesity and cardiovascular diseases, have been a worldwide threat and are majorly responsible for the high mortality rates. Lifestyle diseases, such as hypertension, diabetes mellitus, overweight/obesity, and dyslipidaemia, are among the major risk factors that can lead to the development of cardiovascular diseases. According to the National Center for Biotechnology Information, cardiovascular diseases are estimated to be a major cause of mortality, and represent around 30% of all the deaths worldwide. Thus, the increasing prevalence of lifestyle-related diseases has boosted the demand for medical imaging, which is expected to contribute to the growth of PET/CT systems over the forecast period. PET-CT, which is considered to be a high-end technology, has found wide acceptance around the globe as it provides quality, accuracy, precision, and versatile diagnosis. The combination of PET and CT in a single system is considered to be an evolution in imaging technology where a mix of 2 well-established modalities offer more than the addition of the parts. CT scanners help image the anatomy with a high spatial resolution. Furthermore, malignant diseases can only be checked with this modality - right from the changes noticed in the size of the lymph nodes or from the presence of abnormal masses. However, PET can entirely identify a functional abnormality in case of a lymph node, which is normal in size. Thus, a combination of PET/CT systems offers a better functional assessment of the abnormalities seen on anatomical scans and, conversely, the better spatial localization of functional abnormalities. 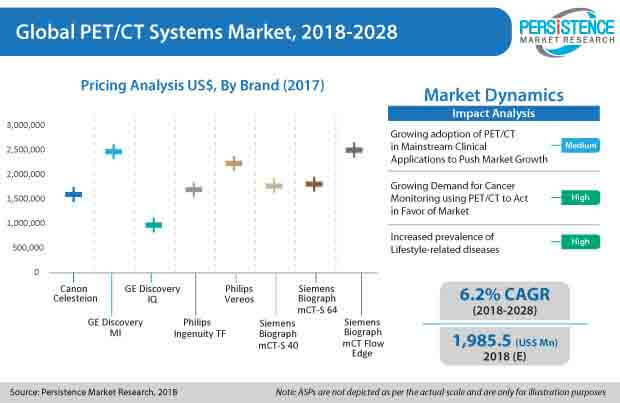 The competition section of the PET/CT systems market report features the profiles of the key players operating in the PET/CT systems market based on their differential strategies, market shares, product offerings, company dashboard, and marketing approach. Examples of some of the key players operating in the PET/CT systems market are Siemens AG; Hitachi, Ltd.; Koninklijke Philips N.V.; Canon, Inc.; General Electric Company; MinFound Medical Systems Co., Ltd; and Neusoft Corporation. PET-CT systems perform imaging in the field of nuclear medicine. PET/CT systems are used for producing sequential images from both the devices combined in the same run. PET produces functional imaging that provides the spatial distribution of biochemical or metabolic activity in the body in a more precise alignment and is also correlated with the anatomical images produced by CT systems. PMR conducted a research study on the PET/CT systems market for the forecast period 2018 to 2028. The PET/CT systems report offers a comprehensive evaluation of the business opportunities prevailing in the PET/CT systems market, along with insights on the PET/CT systems installed base by countries, PET/CT systems market trends, PET/CT systems product feature comparison, pricing analysis based on product type, and PET/CT systems market competition. The PET/CT systems report elaborates the macro-economic factors influencing the dynamics of the market and its futuristic potential. The report on PET/CT systems offers a comprehensive taxonomy of the PET/CT systems market based on the isotopes, applications, product type, end use, modality, and region. By product type, the PET/CT systems market is segmented into high-range slice PET/CT systems (<64), Low Range Slice PET/CT systems (>20), and middle-range slice PET/CT systems (21-64). By modality, the PET/CT systems market is segmented into mobile PET/CT systems and fixed PET/CT systems. By isotopes, the PET/CT systems market is segmented into 18 F Sodium Fluoride, Gallium, Flurodeoxyglucose, 62 Cu ATSM, Thallium, FMISO, and others. By end use, the PET/CT systems market is segmented into diagnostic centers, hospitals, specialty clinics, and cancer research centers. By application, the PET/CT systems market is segmented into cardiology, neurology, oncology, and others. The PET/CT systems market has been analyzed across all the regions of Europe, Latin America, North America, East Asia, Oceania, South Asia, and the MEA (Middle East & Africa). What is the revenue potential of the PET/CT systems market across the regions of North America and Europe? Who are the key competitors and what are their portfolios in the PET/CT systems market? What are the major challenges influencing the growth of the PET/CT systems market? How is the intervention of regulatory authorities shaping the growth of the PET/CT systems market?